Shares of Buffalo Wild Wings (BWLD are flying by more than 5% Thursday despite the company's in-line earnings per share results and miss on revenue. "Things aren't as bad as we thought," TheStreet's Jim Cramer, co-manager of the Action Alerts PLUS portfolio, said on CNBC's "Mad Dash" segment. While the company still reported negative same-store store sales growth, it was a little better than what analysts had been expecting. The company is forecasting for a slightly better 2017, which may indicate that 2016 is a bottoming year. Buffalo Wild Wings is benefiting from the professional football season, and its takeout business is doing better. Investors have to keep expectations in mind, Cramer said. When expectations become too negative, it doesn't take great results to change investors' minds. They get too negative on a stock and, when the earnings aren't as bad as expected, often cover short positions or even go long the stock in some cases. 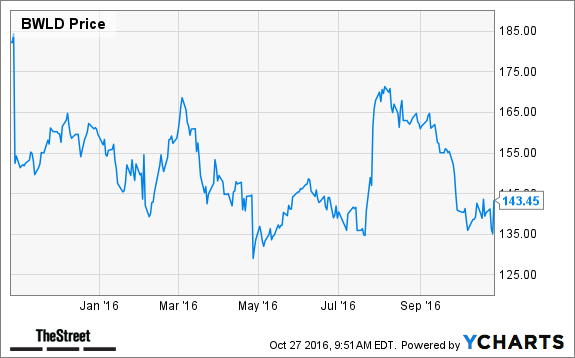 If investors are bullish on the "consumers going out" thesis for 2017, Buffalo Wild Wings may be one to look at. However, Cramer said he's a bigger believer in the "stay-home" thesis at the moment, benefiting companies like Netflix (NFLX - Get Report) and Domino's Pizza (DPZ - Get Report) .